Did you find anything different in this photo of a winner of a dressage event ? Dressage a French term, most commonly translated to mean "training" is a highly skilled form of riding performed in exhibition and competition, as well as an "art" sometimes pursued solely for the sake of mastery. As an equestrian sport defined by the International Equestrian Federation, dressage is "the highest expression of horse training" where "horse and rider are expected to perform from memory a series of predetermined movements." 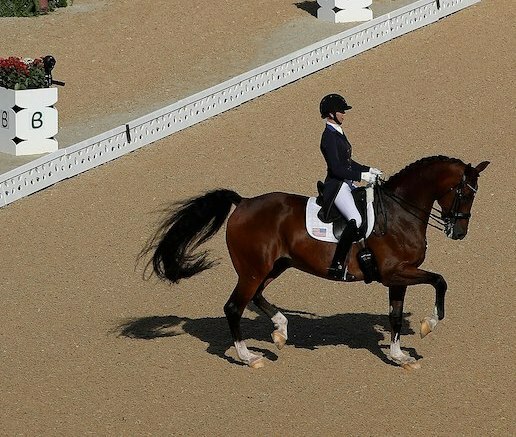 In modern dressage competition, successful training at the various levels is demonstrated through the performance of "tests", prescribed series of movements ridden within a standard arena. Equestrianism made its Summer Olympics debut at the 1900 Summer Olympics in Paris, France. It disappeared until 1912, but has appeared at every Summer Olympic Games since. The International Governing Body for equestrian sports is the Fédération Équestre Internationale (FEI). FEI was founded in 1921. Today, the FEI is the governing body for eight equestrian disciplines: Jumping, Dressage, Eventing, Driving, Endurance, Vaulting, Reining and Para-Equestrian. In Rio Olympics, with scores above 76 for all four riders, Germany clinched the top title, their 25th gold in a sport they had dominated for decades until they were upset by Great Britain in 2012. Germany's Isabell Werth outscored Dujardin with marks of 83.711 compared to 83.025. A mule is the offspring of a male donkey (jack) and a female horse (mare). Horses and donkeys are different species, with different numbers of chromosomes. Of the two F1 hybrids (first generation hybrids) between these two species, a mule is easier to obtain than a hinny, which is the offspring of a female donkey (jenny) and a male horse (stallion). Mules are reputed to be more patient, hardy and long-lived than horses, and are described as less obstinate and more intelligent than donkeys. Here is something on the achievement of a mule called Wallace ! 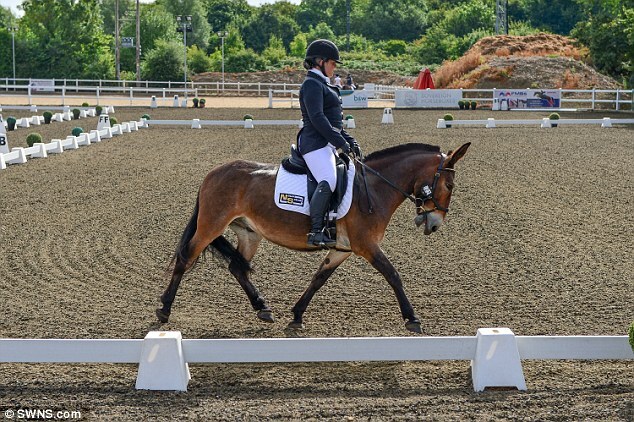 A mule found abandoned and wandering round a village in Ireland has become the first half-donkey, half-horse to win a dressage competition in the UK, after a rule change meant he could take part. Wallace The Great had been turned down from official events and was told he could not be a member of British Dressage, as he is a mule, a hybrid produced from a male donkey and a female horse. But campaigning owner Christie Mclean, 30, from Stroud, Gloucestershire, decided to fight for the mule's right to be treated equally to a genuine horse or pony, which are considered different species, with different chromosomes. 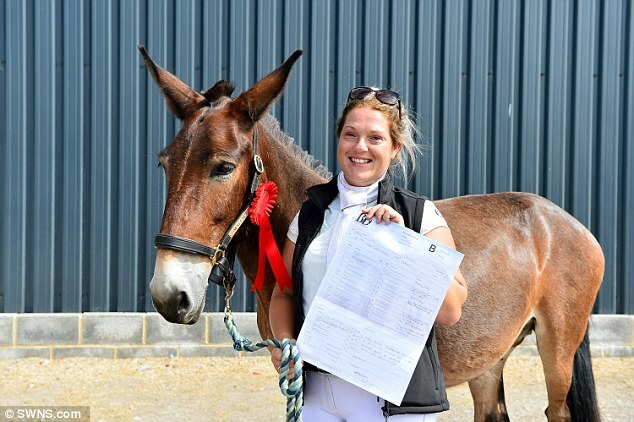 Wallace, with owner Christie McLean, has become the first mule to win a British dressage event after British Dressage earlier this month conceded that mules would now be allowed to compete as a testament 'to inclusion and diversity in dressage, making the sport more accessible to all.' For the first time in the UK, Wallace the Great competed in a British Dressage Quest Club competition, held at Summerhouse Equestrian, Gloucestershire - and beat eight fully horse competitors. Delighted Christie said: 'Wallace won first in the intro class, out of nine. Wallace, aged 11, lives in Dursely, Gloucestershire, with two donkeys and another mule, which was so badly abused it could not be ridden. Wallace scored 67.4 per cent and came top against eight, fully horse competitors. It is a great finish as earlier Wallace was found wandering around a village in Ireland and rescued by the Donkey Sanctuary, where he was fostered by Christie's friend, Lesley Radcliffe. For the past six months, Wallace and Christie have been training together and the mule's aptitude for dressage became clear. And Wallace proved he was more than equal in ability and intelligence when he scored 67.4 per cent in the competition. 'It is like a mule version of Babe the pig. Babe wanted to be a sheep dog, and Wallace is the mule that wants to be a horse. Its owner joyfully said - 'It's a double achievement - he's made history for mules, and British Dressage. Some 14,000 people are members of British Dressage and compete in 2,000 competitions every year.